Our North Creek professional and courteous sales staff is uniquely qualified to help you purchase your Adirondack home, building parcel or commercial property. Please call or stop in and meet us! Hello, from the top of Gore Mountain overlooking the vast 6 million acre Adirondack Park. Jill Broderick, Founder & Broker of Broderick Real Estate, having over 28 years of Adirondack Real Estate experience in the North Creek and the Gore Mountain Region. 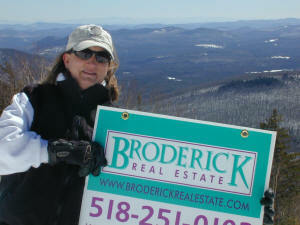 Living and working in the Adirondacks has numerous advantages for the purchasers of real estate and the sellers alike. I like to think that the #1 reason, is that it saves you your valuable time shopping around and your money by working with people with an abundance of knowledge of the area and of the marketplace. Our company is dedicated and committed to advancing the real estate profession in the Adirondacks. We are Members of The National Association of Realtors, The New York State Association of Realtors, The Warren County Association of Realtors and The Warren County Multiple Listing Service. Grateful for the accomplishments of my dedicated, hardworking, fun-loving sales staff, many thanks and gratitude to my past, present and future patrons, your business is always appreciated. We all look forward to meeting you in person and showing you the available inventory in, and around the North Creek & the Gore Mountain Region, including the many beautiful lakes: Friend's Lake, Loon Lake and Brant Lake, in the Tri-Lakes Region of Chestertown. I sincerely hope that you find working with Broderick Real Estate to be a pleasant experience.